Learn how to do a free candida saliva test to determine whether you may need treatment for yeast overgrowth that can sometimes be confused with ADHD symptoms and autism signs. Many people are unaware of this underlying cause for fogged thinking, spaciness, and irritability. In fact many doctors might claim that it's not really a concern, but if you spoke with an integrative physician, they would probably state otherwise. With the frequent use of antibiotics and diets high in sugar, symptoms of candida overgrowth are becoming more and more common in individuals of all ages. It may seem like merely a medical problem, but when it causes poor concentration as well as mood swings, it can also become a child behavior problem. If you suspect your child may have symptoms this page provides instructions on how to do a simple free candida saliva test that can be done at home. First thing in the morning before drinking or brushing teeth, have your child spit into a glass of water (do not use tap water). Immediately observe the saliva. Check back in 2-3 minutes and again in 15 minutes. 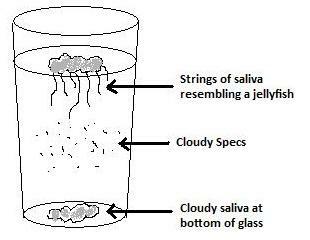 Yeast weighs more than water, so if there is yeast present after doing the saliva test, it will start to have string like particles hang into the water resembling a jellyfish. Then it will gradually float to the bottom of the glass resembling a cloud or cloudy specks in the water. The faster it does this the worse the overgrowth is. Healthy spit will float on top and gradually be absorbed into the water. What does a candida saliva test look like when positive? It is possible you might obtain a false negative with this saliva test, so if you truly suspect your child has a problem be sure to see a healthcare practitioner that knows how to treat candida and diagnose it as well. It is important to rule out this possibility if your child has any of the symptoms associated with this condition before diagnosing with autism or ADHD. Treatment for yeast overgrowth is often an autism biomedical treatment. It generally includes eliminating foods from the diet that promote growth (e.g. sugar, carbohydrates that contain yeast like pretzels, and cheese) and adding nutritional supplements, such as probiotics that encourage the growth of healthy bacteria in the gut. Yeast can also be linked to constipation, excessive fatigue and food sensitivities so if these are medical concerns that I definitely recommend doing this simple at home test. 1. Perkins, C. Identifying Candida Symptoms. www.holistichelp.net. 4-4-2011.